I just got off a web meeting with the folks at Siemens PLM and an engineer from Local Motors regarding Solid Edge Design1, the dumbed down version of Solid Edge that Siemens PLM is making available to members of Local Motors at $20 a month. I usually don’t write about a software product without actually using it. Its been a few days now that I signed up for a trial of Design1 at the Local Motors web site. I am told that it will take another four days or so for then to approve my request. I wanted to know the reason for having a stupid approval process for letting people try a dumbed down version of a professional grade CAD product. But nobody at Siemens PLM or Local Motors could give me a answer that satisfied me. They said something about being able to get “controlled feedback”. Well, if you are going to make a noise about something today then people want to take a look at it today, not a couple of weeks from now. People’s attention span is too small these days. And to add insult to injury people need to be approved before they can be given access to the software. In my opinion, this whole thing is a marketing blunder and Siemens PLM runs the risk of getting “zero feedback” instead of “controlled feedback”. I was given a web demo of Design1, which is basically Solid Edge with quite a few things turned off. When you try and do something that is not available in Design1, you are are urged to contact a Solid Edge reseller or technical support (who I guess will tell you to contact a Solid Edge reseller). 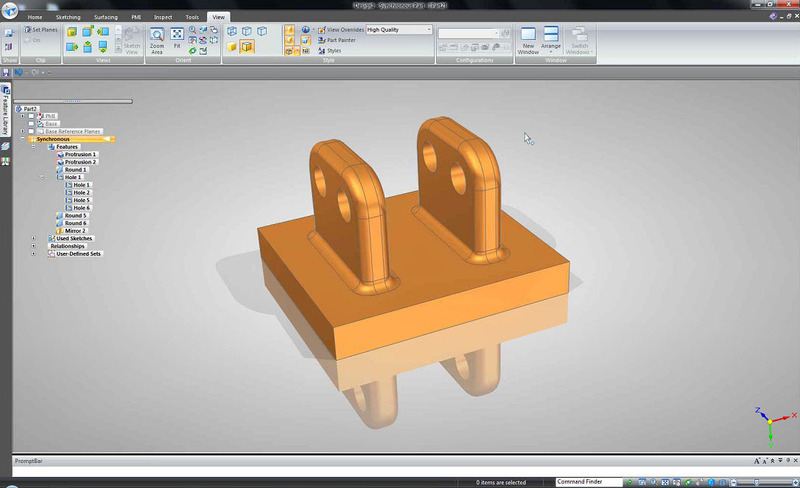 With Design1 you can create only parts and assemblies. I found it weird that Siemens PLM decided to leave out 2D drafting, especially since they already give away Solid Edge Drafting for free. Common sense, anyone? History based parametric modeling is another thing that you cannot do in Design1. When I asked why I was told that Siemens PLM is using Design1 to bridge the gap between free tools like SketchUp and the high end tools like Solid Edge and NX. I wondered aloud, “In that case people cannot really design cars with Design1“. They explained that the idea of Design1 was to give people the tools to start their automotive related designs. Hence the “1” in Design1. When they felt the need to do advanced automotive design then they would need to move to Solid Edge. I asked instead of dumbing down Solid Edge to Design1 and charging $20 a month for it, why not let Local Motors members use the full featured Solid Edge Student Edition for Local Motors projects and charge them $20 a month for it. Apparently the person most qualified to answer that question, Karsten Newbury, wasn’t on the conference call. Having said all of the above Design1 appears to have quite a decent amount of functionality. Here is a part that was quickly mocked up during the web meeting.